The championship was won by the National League’s representative from St. Louis, who bested the American League’s New York in a 7-game series that ended with Babe Ruth being thrown out trying to steal second base and move into scoring position as the potential tying runner. It was the first-ever championship for St. Louis (N), who (at the time of this writing) has won 11 titles. For New York (A), it was their 4th appearance in the title game since 1921. The regular season featured great pennant races in both leagues. In the NL, St. Louis and Cincinnati were back-and-forth until the final week of the season, with the former finally finishing 2 games ahead in the final standings. Pittsburgh and Chicago were each within 7 games as well. In the AL, New York finished just 3 games up on Cleveland. 6th place Detroit was just 12 games behind, with 5 teams finishing within 10 games of the pennant-winners. Lou Gehrig (.313, 16 HR, 109 RBI) joined Ruth (.372, 47 HR, 153 RBI) and Tony Lazzeri (.275, 18 HR, 117 RBI) to lead the New York (A) offense, while Herb Pennock (23-11, 3.62) and Urban Shocker (19-11, 3.38) led the pitching staff. 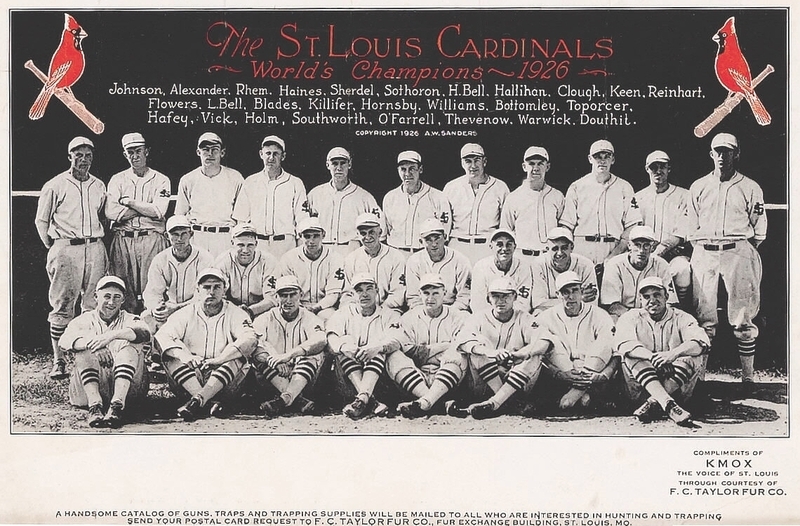 The championship team from St. Louis won behind Jim Bottomley (.299, 19 HR, 120 RBI), Rogers Hornsby (.317, 11 HR, 93 RBI), Bob O’Farrell (.293), Grover Alexander (12-10, 3.05) and Flint Rhem (20-7, 3.21). No big surprise here, right? Ruth and Simmons each had 82 extra-base hits in 1926, while Gehrig had 83. But what’s really interesting is Burns, who had just 4 HR and 3 3B to go along with… sixty-four doubles. How do you get 47 homers in 1926? You pair a set-based 10 Deep Drives with 54 Home Run chances, that’s how. (Compare Ruth to some of the 2017 cards and you’ll see that if you do a cross-era game, Ruth will more than hold his own!) Williams only played 108 games, but had 17 homers in his 39 extra-base hits. Ruth led the league with a .516 on-base percentage, 71 points higher than any other qualifying batter (Harry Heilmann). The 39-year old Collins didn’t qualify for the league lead, but his .441 OBP would have put him among the league’s best. New York led the American League in runs and also struck out a whopping 26% more than any other team (580 to 460), giving further evidence that strikeouts aren’t the end of the world. Lazzeri (96 SO) and Ruth (76) finished 1st and 3rd in the league. There aren’t a whole lot of high-stolen base guys in 1926, but these are some of the best. Be aware, though, that league stolen base rates weren’t too great back then. Players ran with reckless abandon, so even these A stealers will get pegged plenty often. Jones had one of the top ERA (3.09) in the NL. Crowder didn’t serve up many deep balls, but his walks and inability to hold opposing base runners will inflate his ERA. What does one even see about a guy who went by the name “Lil’ Stoner”? The 6 Deep Drives allowed will help boost him up towards that 5.47 ERA. Pete led the league with a 1.11 WHIP, with Kremer, Petter and Pete Donahue each falling behind with a 1.18 WHIP. Knuckleballer Eddie Rommel’s 1.27 was one of the best in the AL. Lefty Grove fanned 194 batters, 35 more than any other pitcher. Vance made just 22 starts, but struck out a league-best 7.5 men per 9 innings of work. I have trouble picturing 1926 pitching staffs from focusing on shutting down the opposing running game, but apparently it was important to Wilbur Cooper. Ruel was an on-base machine at the plate. Behind the plate, however? He’s going to give Washington pitchers fits. Though none of them are at key defensive positions, check out Chicago (A) with three 5s out there! Both Chicago teams finished with league-best .974 fielding percentages. St. Louis (N) led in overall defensive efficiency and have a few 4s to show for it. Love reading these! Your card reviews are very cool and add a ton of fun to your game! Glad you like it! I always think about how much fun I had seeing an ad show up in the mail when I was a teenager, showing off some details of a new card set from a game company. That was always a thrill. Hope to bring some of that.